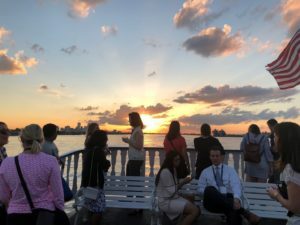 One of the most enjoyable events offered at NPC18 in NOLA was the Women and Planning Division’s evening reception aboard an historic paddleboat on the Mississippi River. More than 200 members and guests enjoyed food, drinks, fantastic jazz, scenery, networking and making new friends while cruising the river. The 300th birthday of New Orleans and Fleet Week festivities were also underway, so the cruise ended with fireworks. SDSU Professor Sherry Ryan and student Jennifer Hunt attended, along with SDAPA Section Director Rachel Hurst. The Women and Planning Division was created in 1970 and has 1350 members from the USA and a dozen foreign countries. One of their current initiatives is to track the gender balance of the AICP College of Fellows. This is of special interest since SDAPA’s first female Fellow, Betsy McCullough, was inducted at NPC18! Join the Women and Planning Division and join us at the next NPC.